At Mingus Software, our primary mission is to put the customer at the heart of our decisions and actions. Thus, when one of our customers receives a distinction or stands out because of a project or event, we are proud. It means that they have been successful, which is also a reflection of our success. Over the last year, many of our customers have received recognition for their work, and we think it is important for us to mention those instances. In January 2019, a new hotel with a unique concept will open its doors in the heart of Old Quebec. Thanks to an eco-friendly vision, Jean Campeau, promoter and co-designer of the hotel carrying his name, orchestrated the project of the hotel Monsieur Jean – Hôtel particulier. Mr. Campeau wants to be “as local as possible” in his approach. The hotel Monsieur Jean has also been designed so that the residents of Old Quebec can enjoy the restaurant and the lobby, even if they are not guests at the hotel. The goal is to be closer to the community, and to be able to offer a different experience to guests throughout their stay, if they want it. This year, the Monville Hotel has received a lot of recognition. Indeed, this modern Montreal hotel has been awarded the prestigious Cogeco / Videotron Hotel Award of the Year 2018. It has also been declared winner of the Hotelia award in the categories “Coup d’éclat” and “Socially Responsible”. Last but not least, the Monville Hotel received the Tourism Excellence Award, in the “Accessible Tourism” category, in addition to the Commercial Development Award. Besides, Hotel Monville is a very technologically advanced establishment. It is the very first hotel in Canada to use a robot for room service. This robot can take the elevator alone, bring meals or other items to the rooms, and even call the room to notify you of his arrival. In addition, check-in terminals in the lobby allow guests to check-in and check-out by themselves, and get their own room keys. Last October, Hotel 71 in Old Quebec, was happy to hear that it was ranked 3rd among the best hotels in Canada, making it the best hotel in Quebec. The award was given to them by the Reader’s Choice Awards 2018. A Certificate of Excellence for the year 2018 was also awarded to Hotel 71 from TripAdvisor for its 13th place in the list of the best hotels in Canada. Thank to the authenticity and luxury of the establishment, Hotel 71 announced in June 2018 that it was now part of the Preferred Hotels and Resorts network. In July 2018, the Estrimont Suites and Spa Hotel enjoyed a record occupancy rate of 94.6%. This is unheard of since the opening of the hotel, in 2006. The rise in US occupation has even allowed the Estrimont to achieve a 100% occupancy rate for 38 consecutive days. What a great success! This year, the Hotel Le Saint-Germain in Rimouski has been inducted into the TripAdvisor Hall of Fame. It has proudly received this prestigious award for being recognized for the fifth year in a row with the Certificate of Excellence Award. Hôtel Le Saint-Germain is the only hotel in Rimouski to get this recognition. Last October, the Quebec Institute of Tourism and Hospitality (ITHQ) celebrated its 50th anniversary, with cheer and spirit. Nearly 1000 people were present at the big party. Happy birthday ITHQ! The Auberge de la Montagne Coupée, in Saint-Jean-de-Matha, is in full expansion. The goal is to diversify what they have to offer, in order to better serve the industries of tourism, business and events. Aiming to be more eco-friendly, certain features have been put in place, such as charging stations for electric cars, or a lighting system that limits light pollution. New rooms and a large terrace have been built to accommodate many guests for various events. All with the view of the cliff! 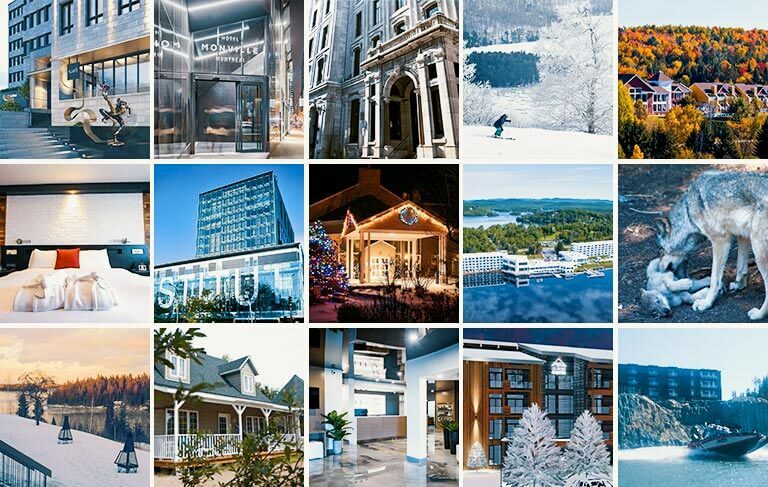 The summer of 2018 was prosperous for the Estérel Resort, located in the Laurentides. For the months of July and August, the famous resort experienced a 100% occupancy rate. This is the third year in a row that the Estérel Resort recorded a 100% occupancy rate for the month of August, but it was a first for the month of July. What an achievement! In 2018, the Omega Park in Montebello, decided to expand its experience, by adding a cottage in the forest in which 4 visitors can sleep in the heart of the wolf pack. Large windows offer views of the forest and lets you watch the wolves safely. A unique experience of its kind! The Dam-en-Terre Resort in Alma will receive more than $ 1.8 million in financial assistance from the Government of Quebec, the Government of Canada and the City of Alma. This investment will be used to build a new captaincy, which will provide a high-quality welcome to visitors of the region. This summer, the Pourvoirie du Lac Blanc was told that the Quebec government would be investing $720,000 for its expansion projects. In fact, in the near future, the Pourvoirie du Lac Blanc intends to start construction of a multifunctional center and new cottages, the development of two new lakes and the expansion of its inn. They also wish to add tepees, yurts and a longhouse to offer visitors more options. In the past year, the Navigateur Hotel in Rimouski has undergone several renovations and has partnered with the C Hôtels Network. In addition to this revitalization, downtown Rimouski will get a Noah Spa, a unique spa concept in Canada, as well as 14 luxury condos with a view of the river. Jean Grégoire, real estate developer and director of the C Hôtels Network, plans to build condos in Petite-Rivière-Saint-François, at the foot of the Massif de Charlevoix mountain. In order to keep the spirit of the C Hotels Networks’s members, the project was named Les caches de la Grande Pointe. Congratulations on this major project! In order to meet the growing demand, La Cache du Domaine, in Thetford, plans to expand its establishment by adding 32 units. Consequently, these renovations will link the hotel to the nearby Noah Spa. This project will also better serve conference clients, as the Thetford Convention Center is planning to open soon. This year, the Lake William Manor celebrates its 25th anniversary. This family business has evolved a lot over the years. With only 8 rooms originally, the Lake William Manor now has 55 rooms. The family who owns the Manor is proud of what has become of their enterprise that began 25 years ago. They intend to continue sharing the vision they have held for a quarter-century, that of being ” happiness makers”. In 2018, a second establishment celebrates its 25 years’ anniversary: the Auberge Aux Quatre Matins. In addition to celebrating 25 years in business, the Inn also celebrates its 10 years under the same administration, thanks to Dominic Benjamin, who became co-owner of the Auberge when he was only 21 years old. He was able to bring vigour, and his ideas managed to make the Inn stand out. Another great success! To meet the demands of families visiting Carleton-sur-Mer, the Hostellerie Baie-Bleue decided to purchase a motel and 6 cottages. As a result, the establishment will be able to accommodate more tourists and delegates, since the Hostellerie Baie-Bleue is annexed to the Convention Center of Gaspésie. This year, the Hotel and Suites le Dauphin in Quebec received the TripAdvisor 2018 Traveler’s Choice Award, in the category “Top 25 Family Hotels – Canada”, for the second consecutive year. The hotel ranks seventh in Canada, and first in Quebec. A beautiful attestation of success and perseverance! Since the number of family caregivers is constantly increasing in Quebec, the Augustinian Monastery has set up a program that offers relief to caregivers. Activities and care are provided so caregivers looking after loved ones can rest and rejuvenate. A very nice initiative from the Augustinian Monastery! These mentions represent only a few of our distinguished customers, but we would like to congratulate all of those who are not in this list. So congratulations to all, we are proud to play a part in your success!